When Game 1 of the Alumni Showdown at Comerica Park was on the line, 74-year-old Red Berenson was the one taking a key defensive face-off. 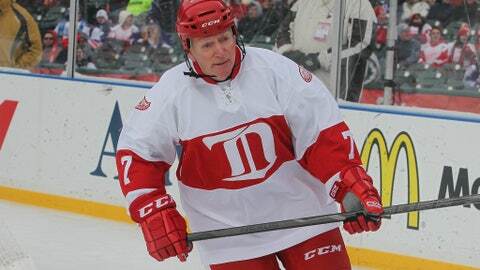 DETROIT — Red Berenson is on the ice almost every day as coach of the Michigan Wolverines, so it came as little surprise to the 74 year-old that when Game 1 of the Alumni Showdown at Comerica Park was on the line, he was the one taking a key defensive face-off. "My head was into it," Berenson said of the game’s last face-off. "I’ve been doing this every day as a coach, but nevertheless, (coach) Scotty (Bowman) put me out there, and good, he knew I could figure it out. "I played for Scotty for a long time (in St. Louis), and it feels good to have a coach’s confidence. I feel the same way when I put somebody out there — you better win it." With the Wings up 5-4 with just under 14 seconds to play, the Maple Leafs were mounting a last-minute comeback against Detroit goalie Eddie Mio, but Berenson had other ideas. He told his teammates that he would tie up his man and that Jiri Fischer would take the puck and get it out of the Wings’ zone. It didn’t work out quite like it was scripted, but the Leafs were aware of the oldest player on the ice. "I was impressed with Red Berenson," Toronto’s Brad Marsh said. "He’s 74 years old and he’s my new idol. I don’t know how close you guys were watching the game, but the last face-off was hugely impressive. He’s so strong on the puck. Our guy couldn’t win the draw because he just clamped right down. It’s impressive." As impressed as the Leafs were with Berenson, it was the 33-year-old Fischer who seemed to marvel at a player 41 years his senior. "For the last shift, Red Berenson, being the greatest coach in college hockey, he had a game plan," Fischer said. "He huddled us all together. He basically told us what to do. "Unfortunately, we didn’t execute how he mastered the plan, but we kept the puck out of the net." For his part, Berenson downplayed his age and the significance of the last face-off. He still enjoys the game and is as competitive today as he was as a youngster in Western Canada. "I think I’m lucky," Berenson said. "I’ve been able to stay in the game and stay around young kids playing hockey. "I just feel honored to be able to play in this event with guys that are a little younger than me and not hurt the team, so it was really fun, really fun."